Replacing a Keithley 2015 THD display - scary stuff! It is probably around 15 to 20 years old so the display was rather dim. I checked the voltage and it was 36.4V which was close enough to the 37V that is the nominal value so I knew it was the VFD display rather than any caps (I'd replaced all the electrolytic ones anyway). Without a great deal of hope I approached Keithley (now Tektronix) about getting a replacement display board - no luck with this but I also asked them about the display itself (part number DD-52) and they were happy to sell me this for £53 + VAT. Unfortunately to fit this you need to desolder the old part (34 pins) and lever it off the board (it is stuck down with double sided tape). Having just acquired a Denon desoldering gun off ebay (thanks to dunkemhigh for putting me onto this) the desoldering went fairly smoothly though I had to resolder and repeat a few times on a few recalcitrant pins. The problem came with the sticky tape and a few odd threads of solder perhaps which required me to gently lever off the old display - one of the 34 tracks lifted from the board! I carried on regardless, fitted the new display and attempted to solder the wayward track to the side of the display pin. I meant to record this saga in photos but forgot so here are a couple of photos of the old display after removing and a photograph showing the new display nice and bright (the same as my much newer K2000). By the way, the display part DD-52 seems to be common to all Keithley's models (K2000, K2015, K2010 I think if you look at the service manuals). Re: Replacing a Keithley 2015 THD display - scary stuff! Tip for next time is just to cut all the pins off and desolder the stubs one by one. That way you do not damage the board. The double sided tape is easy to cut using some fishing line or a steel guitar string. Then you can get the remains off using some solvent. The problem was I wasn't sure the new display was going to work so I wanted to retain the option of replacing the original which at least did work even if it was rather faint. The double sided tape wasn't of the sort that could be cut with fishing line (I think that you're thinking of the thick white stuff), it was more like black electrical tape that was sticky on both sides. Again I wanted to leave it in-tact to use with the new display. You're advice is very sound though, and IF I ever do the job again and knowing that the new display is the right type I'll cut the pins and do them one by one. That black tape normally responds well to being gently heated to around 100c then it tends to release. You might come across a thermoset type that needs 100C to cure, but I do not see that in electronics, it is more common in automotive use to put panels together. It actually is not sticky until toasted. I'll bear this in mind if I come across a similar problem. One issue though was the tape wasn't visible until I'd already levered up the old display. Also I have a bit of nervousness about heating up glass displays with a hot air gun (though I suppose I could heat the whole board). And don't for get take loads of pictures as you go along for reference reasons , may help you when putting it back together. Yes, I generally do this - in fact in this case I already had a lot of photos from taking it to bits to replace the capacitors also there are a couple of teardowns on this forum (a video one of Dave's and a photographic one from a couple of years ago). I just failed to photograph the removal and replacement of the display. Just found this thread......am looking to get the display on my 2015THD replaced also.......thanks for the heads up, here's hoping they have more displays in stock. Watched, and nice to see. 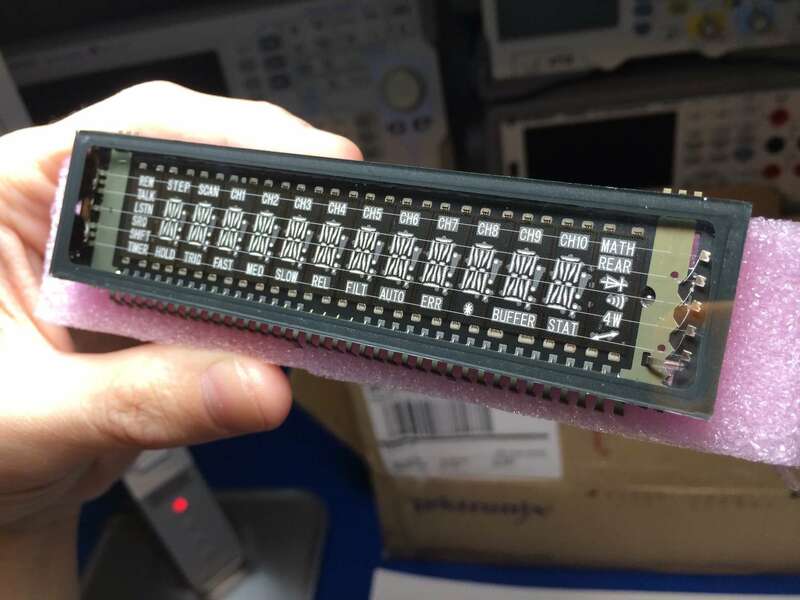 Next time to align the pins on the display just take a piece of veroboard and use it as a jig to align the pins, you just start at one end and gently wriggle it till all pins are on the 0.1in spacing. Then you have them all neatly aligned for placing in the hole. BTW you do not need all the tape, only a piece at each end will do, the display is not going anywhere. I contacted Keithley about getting a replacement screen. I fell off my chair when the quote came back at $1800. I think they misunderstood my e-mail and quoted on them replacing the screen (And I hope calibrating the whole thing), but still very expensive. What department / branch from Keithley did you fellas contact for the parts? When you guys log back in and read this, if you can let me know where you contacted to get the parts, that would be greatly appreciated. If it was $100-$150 including shipping, I am happy with that. I am based in Cambridge in the United Kingdom and am looking to replace the existing display board in my Keithley 2015 THD. The Keithley part number for the whole board is 2010-110. The part number for just the display is DD-52 (though I would prefer to replace the whole board unless the display is much cheaper). I am also looking to replace the plastic board stops, one of which broke in transit. Please give me prices for these parts and state where I may obtain them. And they responded with pricing. Keithley had not been taken over by Tek for very long at that stage, perhaps Tek have now clamped down so the Keithley bit is being a bit stricter about supplying parts. Thank you for the quick response. Maybe it was because I emailed their Singapore office rather than the generic email address. I will check a few things internally (like the voltage to the screen) and go from there. I understand from their point of view that they don't want end users doing repairs as it might make things worse and could possibly affect calibration (particularly if things are touched that shouldn't be touched). If it was $200 for them to replace the screen, I would pay up, but not for $2500. I just received a replacement transformer from Tek for a Keithley unit, so maybe it's the part of the world you're in. Don't expect $100, though... $300 will be more likely. In my case they wouldn't sell me the display board, but the display itself was quite cheap (£53 ex VAT which is around $75). The little plastic stops that I also wanted to replace were very expensive though, for what they were - £12 for a little bit of cheap plastic I think! I have e-mailed the generic head office e-mail. I tested the voltages and they are within the 5% tolerance as per the service manual. Hopefully I get a more positive reply to this one. Nope, just got a reply from the same service person who emailed me the original quote from Singapore. Looks like my email just got bounced off to the closest service centre and they aren't doing spare parts anymore. I ordered a DD-52 display just last week, by phoning 1-800-833-9200. They told me I could have also ordered by emailing buy@tek.com. Did not think they sell component-level parts tho. I wonder if it is just because I am in Australia that they palm me off to their Singapore service centre who doesn't want to deal with parts like this. I am pretty sure my 2015 has a faded display, but I am not sure what they look like when new, so have nothing to compare it to. Even taking photos of it, the camera can change exposure so it is very hard to get a reference photo. I have three Keithley 2000s and two Keithley 2700s right now. I'd guess that there is at least a 2x difference in brightness between them, with the dimmer ones being a bit too dim to be useful. I'm planning on doing the trick of heating to the fillament to glowing briefly on the dim ones to see if that makes a difference. If not, its nice to know that I can order a new display for ~$70 if I know what part numbers to ask for. I am going to swap mine soon. The original is faded like yours. I will do my best to take before and after photos that demonstrate the difference. I'll also add that if you even slightly suspect the display is faded, then it is. A bright VFD is obvious. I just bought a NOS Agilent 53132a and was amazed at how bright a brand new VFD is. I recently picked up a "lightly used" Keithley 7001 on eBay for peanuts (the seller accepted my <$100 best offer). I have no real use for it, and was just going to play with it or use it for parts. It has an extremely bright display, so I suspect it was used in an integrated test system with the display off. Can someone who is able to order / receive the parts pm me? If you can get a post (or other shipping) quite too me and it is reasonable I can PayPal you the money for the screen, shipping and a bit extra for your time. I'm in australia, will give my postal address via pm. I had some comparison and "workaround" for faded VFD on my 2000 covered here and on forum thread here. I installed the new display in my 2015-P over the weekend, and it looks brighter and the brightness is more consistent. As expected, it's difficult to tell the difference in photos and on video, especially since my display wasn't that dim. I couldn't reproduce the lighting conditions in the before vs after photos, so they aren't of much value. The primary difference is the consistency of brightness.